Comments: Connecticut State Council of Defense rally to be held in Northford with message: This Is No Time To Talk "Peace"! "VICTORY" IS OUR WATCHWORD! and speech topics including "Victory or Servitude" and Woman's Part in Victory." Big red letters of title, messages and framing program details. Poster shows well the tenor of the times and that all out war and complete victory was expected. 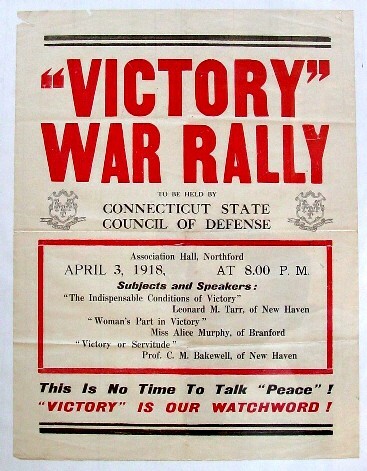 Speakers noted on the poster are Leonard M. Tarr of New Haven, Miss Alice Murphy of Branford and Professor C. M. Bakewell of New Haven. There were not many of these posters issued and few survived. Condition: Unbacked, some edge tears in top right corner that can easily be repaired or framed out and tack hole in upper right corner.